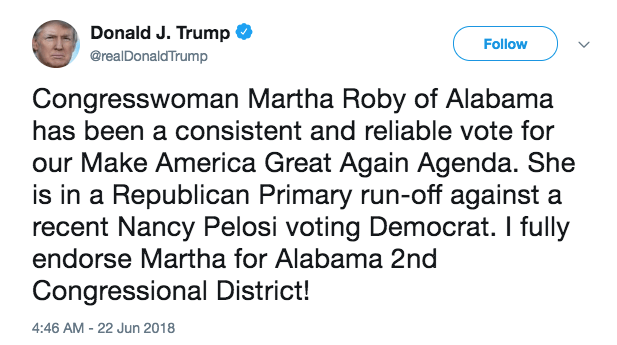 With less than a month before Alabama’s primary runoff elections, President Donald Trump has weighed-in on one of the most watched races: the battle for Alabama’s 2nd District between incumbent U.S. Rep. Martha Roby and former U.S. Rep. Bobby Bright. “Congresswoman Martha Roby of Alabama has been a consistent and reliable vote for our Make America Great Again Agenda,” Trump tweeted in the early hours of Friday morning. Trump’s tweet is referencing the fact Roby’s opponent, Bright, previously represented the 2nd District as a Democrat and backed Pelosi for Speaker during his time on the Hill. Roby found herself lambasted by the crowded field of challengers due her 2016 criticism of President Donald Trump after recordings of him making lewd comments were released during his campaign for president. Roby said then that Trump’s behavior “makes him unacceptable as a candidate for president” and suggested he step aside to let another Republican lead the presidential ticket. The runoff is the political price Roby has to pay for being one of the few Republicans in the Deep South state to speak out against the president. Trump however, clearly thinks Roby is the better choice despite her criticisms. Roby faces Bright on July 17 in the Republican primary runoff. The winner will most likely go on to win the soundly red district in November.